Caterpillars destroyed the ferns that were growing so well all along the back of the house. How disappointing! Since the nasty critters literally chewed the fronds down to the ground it seemed like the plants were gone forever. But wait! A couple of weeks later new growth appeared. The Sensitive Ferns are growing beautifully now. Hay-scented fern has taken over the space behind the garage over the years and now is extending its reach around the side of the house and past the concrete step at the garage door. Each year the area it takes up is expanded. 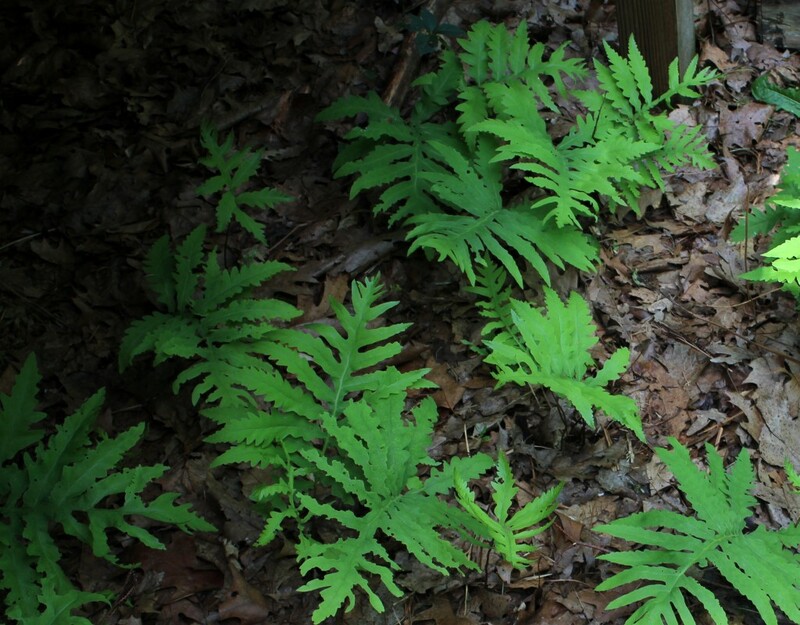 Although it’s pretty when it volunteers in small groups in the forest, beware that Hay-scented fern can take over spaces. To keep the fronds off the house I just walk next to the house with a weed-whacker and remove the closest foot or so of fern growth. Sensitive fern is slow-growing compared to the hay-scented fern. All of the Sensitive Fern fronds were eaten by these totally green, nondescript caterpillars about 2-3 weeks ago. Unfortunately, I didn’t capture the hungry-mothers in photo. Looking at Caterpillars of Eastern North America by David L. Wagner , my best guess is they’re the larvae of the Common Wood Nymph, Cercyonis pegata, whose adult stage butterfly we regularly see around here. Even though the little tubular muncher was totally green its large round head stood out. It was upsetting to see these beautiful ferns destroyed by those insects. After all it is a slow-grower and it took years for it to spread out over this area by the deck. To my amazement new fern fronds are now emerging from the ground! Was I wrong to be upset at the demise of the first fronds? It turned out to be a necessary food source for a future flower pollinator. The adult butterfly may be involved in pollinating several kinds of flowers and in turn be a food source for a bird or other critter. You know, the web of life and all. 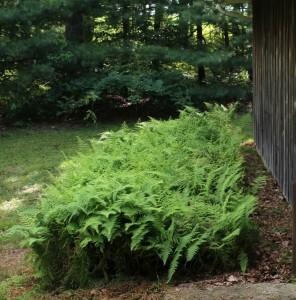 Both of these ferns are growing in area facing due North on the back side of the house. Moss and lichens grow on that side of the roof. Algae grows on the boards of the deck to about 8-10 feet from the house. An area that never gets the sunshine. It’s a great place to retreat to in the heat of summer. When it’s really hot or when you’ve been in the sun too long the shady area next to the house is where you wanna be. The space is big enough to accommodate chairs, people and dogs, and a few potted plants. Being the coolest spot on the mountain ridge, ferns like to grow in this shady place. Elsewhere, there are probably a half-dozen different ferns growing in our little space in the forest. They like the shade of the trees and areas where springs and rainwater flow downhill.